For a format whose history stretches back towards the origins of the game, 2003 may well lay claim to being the most dynamic and pivotal year before or since in the History of Vintage. It was a year in which the format was rocked by dramatic restrictions, metagame convulsions, astounding printings and shocking new mechanics, quickened engagement and interest from the DCI and Wizards of the Coast, and the inauguration of a new annual Championship tournament. The investments of the player base in 2002 were bearing fruit, and the innovations and novel strategic developments were accelerating. New strategies were born, and old Schools of Vintage Magic were revived. In a sense, 2003 was a springboard for the evolution of the format since. It marks a transition from historical Type I to the format that would soon become known as Vintage. Many Vintage players active in 2003 look back on that year with a special fondness. There was a dynamism that was sometimes approached since, but never equaled or surpassed. To many, including myself, it was the Golden Age of the format. What made 2003 so special was a convergence of factors that could not be replicated, and would be undesirable to repeat. The audacity of the new mechanics and shocking printings certainly generated interest in the format, from Mind’s Desire to Chalice of the Void. But it was not these printings that gave 2003 its dynamic energy. It was the innovations from within the format, the surprising discoveries, the untapped synergies, and the narrative coherence that created a diffuse sense of excitement and discovery. Rather than merely borrowing or importing technology or ideas from other formats, the innovations within Type I in 2003 were often generated from within it, evidencing a maturity that the format had heretofore lacked. 2003 was the flowering of a format that had been marginalized and dormant for many years. When green shoots emerged in the early part of the decade, it was the Type I community, organized through web-based communities, that connected far-flung enthusiasts from across the globe. The Type I tournaments at GenCon and Origins provided a place to compete on an annual basis, but it was the community-based tournaments that revived the format at the grassroots level. When these pockets of activity reached a critical mass, then they became the nodes of regional competitions such as The Mana Drain Open (aka The Waterbury), which in turn, helped make events like the Type I Championship a success. Given the lack of support from Wizards, the Type I format, far more than other formats, was a bottom-up rather than top-down format. The dramatic changes in the format in 2003 were not always welcomed, however. In many quarters, there was a sense of whiplash, of too much change too fast, of instability and even brokenness. Long-time players could be forgiven for feeling that way, but it found a prominent expression in Oscar Tan’s 2003 State of the Metagame report in late October. Oscar articulates a perspective that seeks balance between the competitive dynamics now evident in the format and the stability, diversity, and fairness that he felt made the format unique. Calling for a host of restrictions, including Mishra’s Workshop, Oscar polled a number of other players with similar sentiment. The table he published, featuring the viewpoints of the format’s most prominent voices, illustrates the spectrum of opinion on what to restrict and why, with Oscar and Brian Weissman on one extreme, and myself on the other. Oscar was initiating a debate that has never fully resolved, but that no longer simmers. The consensus that won that debate, perhaps by historical default rather than persuasion, was that the speed of the format was a result of its increased competitiveness. This view took the position that the genie could not be put back into the bottle; even with massive restrictions, which might undermine the incentive to innovate and potentially reduce the diversity of the format, the format had fundamentally changed and evolved beyond the casual confines that had defined Type I play for many years. The DCI’s decision not to enact another restriction wave, only targeting Burning Tendrils, set the format on a clear course, indicating that they were comfortable with the speed of the format so long as the format was sufficiently interactive and strategically diverse. Both Oscar and I were guilty, along with others, of overhyping some cards or alarmism at times, and certainly less than 100% accurate in our predictions about the future of the metagame. But Matt’s concerns also underscored another change in the format: the emergence of established voices that carried greater influence on not only the metagame, but the management of the format itself. This is a vision of the game and the format I continue to embrace, but I was mistaken in one key respect: the cards may change, the decks may change, the sets may change, the abilities and mechanics may change, even the rules, but the core Schools of Vintage Magic endure. Those schools that emerged in the first few years of the format’s history evolved and revive with new iterations and new cards replacing old ones. 2003 is perhaps the best illustration of this, as almost every major new archetype serves as a historically prominent, if not pinnacle, example of each School. GroAtog for the Comer school. Psychatog Control for the Weissman School. Burning Tendrils for the Restricted List Combo School. Stax for the O’Brien School. And Dragon Combo for the Reanimator School. 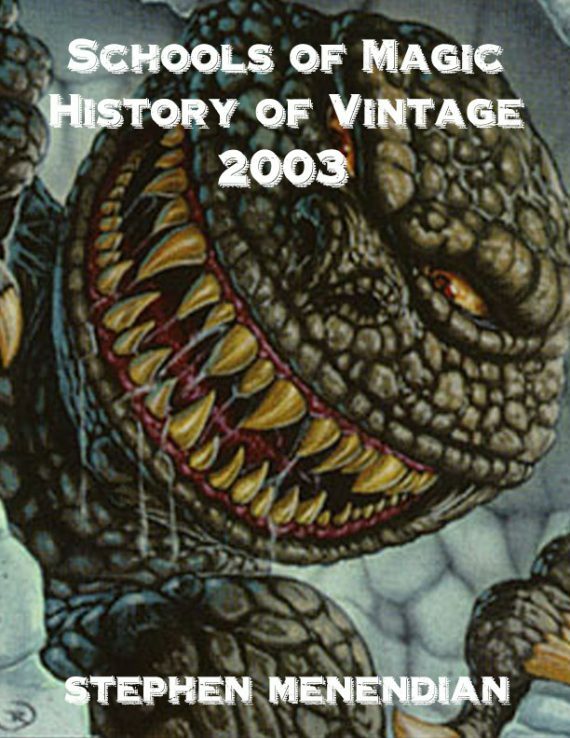 Each of the great Schools of Vintage Magic found new life in 2003, and the result was a vibrant, fascinating, and diverse metagame, the likes of which the format should always aspire toward.